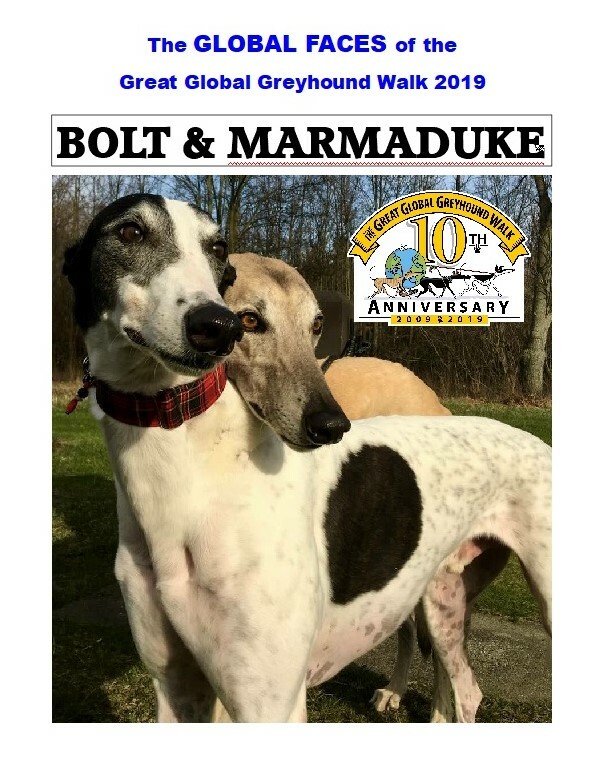 We are Bolt and Marmaduke, the global faces of GGGW! View Bolt and Marmaduke in this video via facebook. This video is sprinkled with some foster friends and house guests. We live in Toledo Ohio USA. We both came from Daytona Beach race tracks to live with our “House Lady” aka RuthAnn. Bolt arrived first and Marmaduke was a foster with no interest from adopters for 4 months. Bolt and Marmaduke were inseparable since day one so he stayed forever. In the video, you’ll see Bolt in a crate after a vicious attack. Luckily, big boy Marmaduke (95 lbs and 33” at the shoulder) saved his life. Thank you for the honor of choosing us as the global faces for 2019! We are very sad to announce that GGGW Global Ambassadog Marmaduke has crossed over the bridge. He had a massive heart attack. Our thoughts are with RuthAnn and Bolt and we send our deepest sympathy. The GGGW team, were just getting to know this lovely big lad and we had already fallen in love with him. 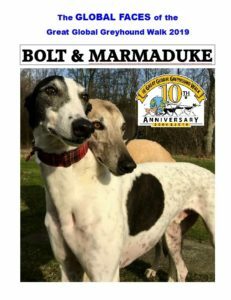 Marmaduke, along with Bolt, are our first ever Global Ambassadogs and Marmaduke will always be remembered by all here at the GGGW team.